Our service range includes a wide range of RE Classic 350 Bike Rental Service, Bajaj Avenger Bike Rental Service, Bajaj Platina Bike Rental Service, RE Desert Storm 500 Bike Rental Service, RE Classic 500 Bike Rental Service and Bajaj Pulsar 200 Bike Rental Service. The smaller twin of the Classic 500, the Classic 350 will hold its own against any other motorcycle and then pull some more. 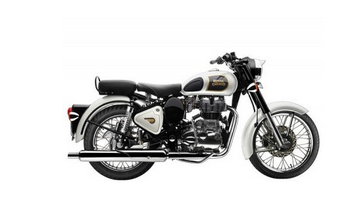 The Classic 350 shares its power plant with the legendary Thunderbird Twin-spark. The torque to flatten mountains and the fuel efficiency to cross entire ranges comes in the same understated yet charming styling. If the city is where you belong, the Avenger Street is the sports star you need. Dressed in all the dark shades and with sporty mag wheels, it is guaranteed to set the streets on fire. Be amazed with the easy maneuverability these straight handlebars provide as you tackle narrow streets or long highways, with equal ease. Bajaj Platina ES comes with an advanced 102 cc engine which makes fuel combustion so efficient that it generates 8.2 Ps power and delivers an outstanding mileage of 96.9 kmpl (as per ARAI testing).New design ,attractive color options, impressive graphics, alloy wheels, sleek rear panels with fluid grab rail design, graphite tint engine and transmission with black silencer and chrome heat shield truly uplifts the looks of new Platina ES. Not to forget, improved superior bright Chrome finish, New Fade-free paint with superior gloss and scratch resistance makes the Platina look elegant and shiny for years. The Classic Desert Storm comes to you with a “sand” paint scheme reminiscent of the war era, a time when Royal Enfield motorcycles proved their capabilities and battle worthiness by impeccable service to soldiers in harsh conditions of the desert. Donning a younger look with styling cues one would expect only from a genuine Royal Enfield: single cylinder air-cooled push rod engine, 1950s style nacelle and toolboxes, traditional paint scheme and buffed engine components, this motorcycle is all set to bring you the pleasures of modern motorcycling while reflecting the aura of eternal classic styling. The Pulsar 200NS is loaded with technology that takes performance biking to the next level. Touted as the next generation of motorcycles in India, the Pulsar 200NS comes equipped with a triple spark, 4 valve engine, liquid cooling, 6-speed gearbox, a perimeter frame, rear mono-suspension and petal disc brakes. The Pulsar 200NS boasts of adrenaline pumping figures like 23.5Ps power and a 0 – 60 in 3.1 seconds. True to its name, i.e. “Naked Sports”, there is no doubt when you look at the Pulsar 200NS that it is one of the best looking street fighters around. The body has been sculpted with careful attention to detail, like the foot pegs or the hand grips or even the backlit switches. Every aspect of the bike has been crafted to ensure the aggressive and muscular look of the Pulsar is married with the next generation technology. The Electra now comes packed with the power and reliability of Royal Enfields latest Twin-spark Unit Construction Engine. Along with the UCE engine come the double benefits of more power, and better fuel economy, more reliability and lesser maintenance. Born as the Fastest Indian, the Pulsar 220F is a performance machine for the true enthusiast. Its powerful 4 stroke, 220 cc DTS-i engine delivers 21Ps power and a healthy 19 Nm torque, making it the most powerful bike in its category. Designed for speed and performance, the Pulsar 220 is perfect for dragging in a straight dash or handling corners with pa. The Pulsar 220F has a stylish semi-fairing that is both good looking and aerodynamic, ultra-stylish LED tail lamp, sporty split seats and split rear grab rails. Standard fitments on the bike include the clip-on handle bar complete with pass switch, electric start, engine kill switch and self-cancelling indicators. The all new Royal Enfield Thunderbird now with a powerful 350 cc engine, a 20 litre tank, digital meter console and LED tail lamps gives a new definition to Highway cruising. Perhaps one of the most anticipated models from the Royal Enfield stable, Thunderbird 350 is poised to enhance the pleasure of leisure motorcycling amongst the touring enthusiasts. Thunderbird 350 with its distinctive "black" styling is all set to make a distinct statement on the roads. Rental Price: Rs. 999 Per MonthRefundable Security : Rs. 1200Minimum Tenure : 3 MonthsNow cold water is nomore an execuse for you to bath everyday this summer. Dont make excuses and rent hot water geyser with premium quality and quick heating. Rental Price: Rs. 179 Per MonthRefundable Security : Rs. 600Minimum Tenure : 3 MonthsAn effective alternative for regular cooktops that warrant costlier gas and cylinders, induction cooktops are an ideal solution for all urban homes today. This induction cooktop is stylish and economical addition that has been designed with several touch buttons for easier control of heat and voltage. The product is very economical and has a big sized crystal plate so that you can prepare your favourite recipes with a fuss. It comes with no staining problems, therefore maintenance is fuss free. Rental Price: Rs. 1,049 Per MonthRefundable Security : Rs. 4000Minimum Tenure : 3 MonthsThe Full HD LED display provides you sharp picture quality with vivid and life like visuals. Designed for Indian weather conditions. It has HDMI connectivity that lets you play movies directly from your laptop. This television features powerful speakers that provide an immersive music experience. Rental Price: Rs. 159 Per MonthRefundable Security : Rs. 600Minimum Tenure : 3 MonthsYou will love the neat and spacious ? ?Glass 2-burner Cooktop and find it easy to cook and maintain in your kitchen. The gas stove has a clean design with a ? ?strong matt steel body. The two burners are placed with a lot of space in between and a drip tray is provided.